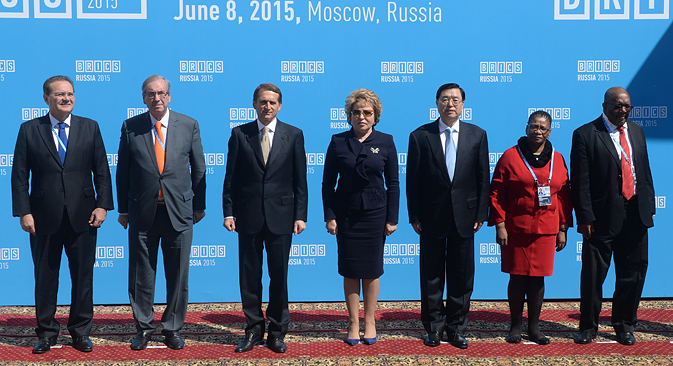 The first BRICS parliamentary forum was held in Moscow on June 8. Parliamentarians from Brazil, Russia, China, India and South Africa called for the transformation of the grouping into an effective international mechanism of cooperation. On June 8, the first BRICS Parliamentary Forum was held in Moscow. Despite the fact that the grouping has existed for almost ten years, this was the first time its parliamentarians met in such a format. The forum coincided with the G7 Summit in Bavaria. During the Moscow session, participants often compared these two associations, trying to underline the positives of the BRICS. Chairman of the State Duma’s Foreign Affairs Committee Alexei Pushkov outlined the association's current objective. He said the grouping would like to become “an international mechanism for consultation and cooperation on key issues in global policy and economy.” He said that this signals a departure from the format in which participants of the association only exchanged opinions. State Duma Deputy Marat Bariev spoke about the course towards integration and the BRICS' future organizational structure, which the parliamentary forum was designed to assist. He said, the parliamentary forum was held to help the legislative organs of member countries to closely coordinate the integration of the BRICS. Bariev said steps towards further integration should be taken during the BRICS Summit in July, which will be held in Ufa. The deputy added that the BRICS, which represents more than half of the world's economic and human potential, is all the more important for Russia, given the difficult geopolitical situation that the country faces. Alexei Pushkov told TASS that there were no plans at the moment to create a BRICS inter-parliamentary assembly. Media reports had indicated that Russia was mulling such a proposal. Chairman of the Standing Committee of the National People's Congress of China Zhang Dejiang spoke about the necessity of further economic integration. He called on the members to move towards the creation of a single market and the realization of common infrastructure projects. Besides economic integration, the parliamentarians also discussed the necessity of creating a new model of international relations. The document also mentions the importance of reforming the United Nations and its security council. President of the Brazilian Senate Renan Calheiros spoke about the need to reform the UN. India and Brazil are looking at becoming permanent members of the United Nations Security Council.